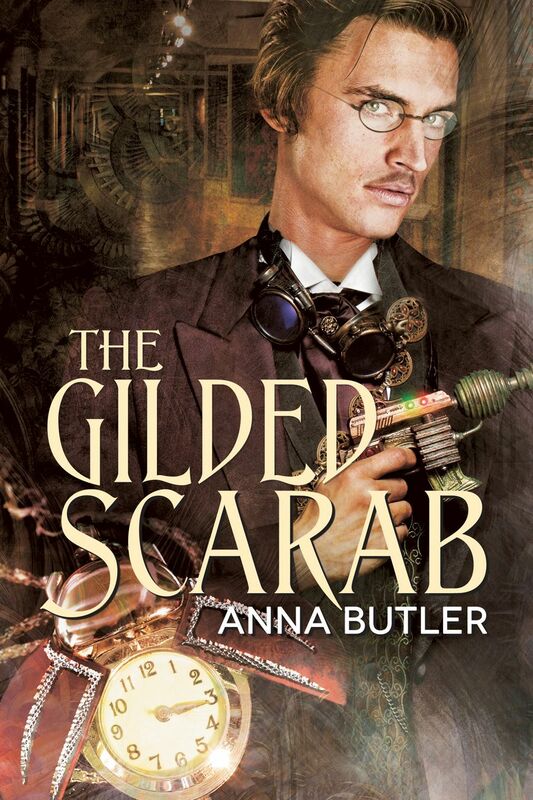 Release Day & Giveaway for Anna Butler’s: The Gilded Scarab! Oh, I am so excited to be able to share this with you! Today, Anna Butler has a new release with Dreamspinner Press: The Gilded Scarab is now available! I can’t tell you how much I’ve been looking forward to sharing this book with you. I had the privilege of beta reading this story before its submission, and oh! There is so much to love! Steampunk! Political intrigue! Egyptology! And everyone’s new favorite book boyfriend: Rafe Lancaster, former pilot for His Majesty, the Queen, now grounded and looking to make his way in the world, without falling into the clutches of his family’s power struggles. 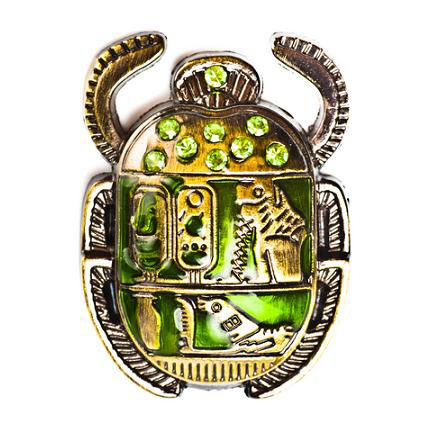 If you love Elizabeth Peters’s Amelia Peabody mysteries and smokin’ hot M/M romance, you’re going to love The Gilded Scarab! Without any further ado, here’s Anna! The Vertue of the COFFEE Drink. First publiquely made and sold in England, by Pasqua Rosée. THE Grain or Berry called Coffee, groweth upon little Trees, only in the Deserts of Arabia. It is brought from thence, and drunk generally throughout all the Grand Seigniors Dominions. 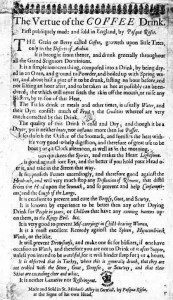 It is a simple innocent thing, composed into a drink, by being dryed in an Oven, and ground to Powder, and boiled up with Spring water, and about half a pint of it to be drunk, fasting an hour before and not Eating an hour after, and to be taken as hot as possibly can be endured; the which will never fetch the skin off the mouth, or raise any Blisters, by reason of that Heat. The Turks drink at meals and other times, is usually Water, and their Dyet consists much of Fruit, the Crudities whereof are very much corrected by this Drink. The quality of this Drink is cold and Dry; and though it be a Dryer, yet it neither heats, nor inflames more than hot Posset. 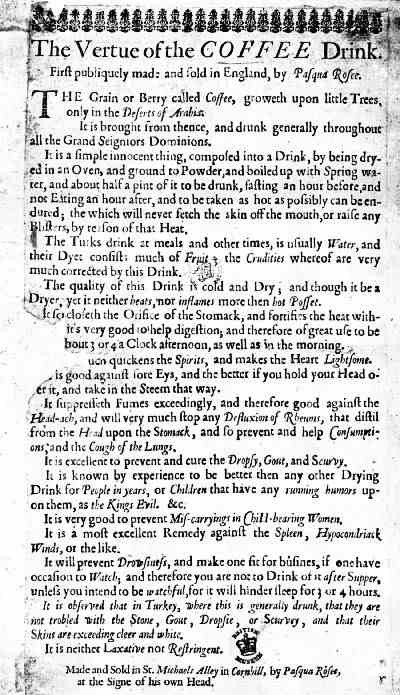 It forcloseth the Orifice of the Stomack, and fortifies the heat with- [missing text] its very good to help digestion, and therefore of great use to be [missing text] bout 3 or 4 a Clock afternoon, as well as in the morning. [missing text] quickens the Spirits, and makes the Heart Lightsome. [missing text]is good against sore Eys, and the better if you hold your Head o’er it, and take in the Steem that way. It is observed that in Turkey, where this is generally drunk, that they are not troubled with the Stone, Gout, Dropsie, or Scurvy, and that their Skins are exceeding cleer and white. Made and Sold in St. Michaels Alley in Cornhill, by Pasqua Rosee, at the Signe of his own Head. Delightful, isn’t it? No wonder Rafe found coffee so fascinating! Now it would please Rafe if you would go and make yourself a cup of coffee, remind yourself that your hypochondriack winds are quite safe and that any defluxion of your rheumas is quite unlikely, and join him in The Gilded Scarab of an hour or two of love and adventure. MY TRAINING at the coffeehouse went on apace. Some things were more easily learned than others. Mr. Pearse gave me ungrudging approval for my skills in making the various brews—he said I had a neat hand with the espresso machine and the slow-drip apparatus, and mixed the various coffee and milk combinations with confidence—but he was outraged (horrified? pitying? all three?) when he realized I had been planning to buy my coffee ready roasted. Perhaps he was all three, but outrage certainly won the day. The scorn stung. I couldn’t argue with that. Protests were a waste of breath. So I laughed and gave myself up to the arcane mysteries of roasting green coffee beans. It astonished me that so far I’d overlooked the roaster. Perhaps my damaged eyesight was worse than I realized, because the damn thing should have been impossible to miss. It filled half the back storeroom with its brooding, massive bulk, a chunk of black cast iron, big as an aerocarrier, with brass hinges and decorative plates and a furnace beneath that looked like something Lucifer himself would covet. But despite its bulk, it was a thing of quirky beauty, from the polished hopper at the top to the enameled cooling tray at the bottom. The best bit was the huge brass handle on the drop door—no plain knob, but a beetle with a blunt rounded head, wing cases opening and gossamer wings, made from the finest of polished brass wires, unfurling to lift it from bright brassy flames. Something in my chest contracted a little. The old man was going to miss this place. He was going to miss it badly. He was right. Within a day or two, I understood why buying preroasted coffee from a supplier would not do. Not merely intellectually understood it, but viscerally and emotionally. It was fascinating. It was science and art, all wrapped up together. I freely admit I went into it a skeptic, but I was astonished to find how much it interested me. Mr. Pearse delayed his retirement for another week until he was quite satisfied I could handle it, although, as he said, it would take years for me to be an artist with the roaster. Because, of course, it would. Comment here and one person chosen at complete close-eyes-stick-a-pin-in-it random will get their choice of a little pack of Gilded Scarab or Gyrfalcon loot, a free copy of FlashWired (a gay mainstream sci-fi novella) and a entry in a rafflecopter to win an Amazon gift card. Come over to the Dreamspinner Facebook page on Tuesday 17th 11am EST (4pm GMT) and get the chance to win a Gilded Scarab coffee travel mug. Go on from there to Rainbow Book Reviews Facebook page on Tuesday 17th at 5pm EST (that’s 10pm GMT) to talk about both Gilded Scarab and my other new release, Gyrfalcon, and get the chance to win a Gilded Scarab or a Gyrfalcon iPad cover. This entry was posted in Uncategorized and tagged announcements, Dreamspinner Press, guest blog, male male romance, promo, Sarah Madison, writing by Sarah Madison. Bookmark the permalink. Hugs you, Sarah. Your support has meant so much to me – and to Rafe! – on this journey. You’re the best. So well-deserved, my dear! 🙂 I’m so pleased that The Gilded Scarab has had a smashing release day! Sarah Madison recently posted..Release Day & Giveaway for Anna Butler’s: The Gilded Scarab! I’m so excited to see this book come out! Can’t wait to read it. Thank you, Dottie! It’s been a breathless sort of day so far! 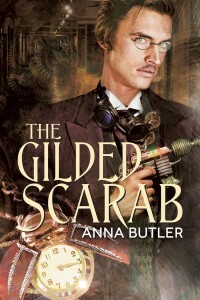 Congrats Anna on the release of your new book The Gilded Scarab! Thank you, Laurie. It’s been an exciting day! I hope you enjoy Scarab and Rafe. The stick-a-pin-in-it method chose you to get the little bag of swag and a copy of FlashWired. Do email me at annabutlerfiction @ gmail .com with your snailmail address and I’ll get it off to you asap. You’ll get FlashWired as an ebook by email. Congrats on the new release! It sounds very intriguing, I’ve been waiting for this since I saw it on goodreads. Thank you, Serena! I hope you enjoy it. Don’t think I’ve read any steampunk novels before. I’ve been fascinated in Egyptology for years, so the mix of the two in this story intrigues me. Congrats on this new release. I love Egyptology too – lots to talk about at the next UK meet! I’m really excited about it! And wishing that I didn’t *have* to get work done this afternoon, but it’s the carrot hanging in front of me to get back to work…. Hope you enjoy it, Nicole!